Ujjain is one of the oldest cities of India. It is located in the Malwa region of Madhya Pradesh state. In ancient times Ujjain was known by the names of Ujjayini and Avanti. It is situated on the eastern bank of River Shipra. Ujjain was referred to as Ozene by Ptolemy. Ujjain is one of the seven sacred cities of the Hindus. Ujjain is one of the four sacred places where the Kumbh Mela is held. The Kumbh Mela festival is held at Ujjain after every twelve years. Ujjain is also home to one of the twelve Jyotirlinga shrines in India. Ujjain is considered a sacred city for the Hindus. The Mahakal Temple, housing one of the twelve Jyotirlingas, is the most famous and respected Shiva temple. Other important temples of Ujjain are Harsidhhi (Durga Temple), Chintaman Ganesh, Gadh Kalika, Kaal Bhairav and Magalnath. Since Ujjain is an ancient city, there are many monuments that have survived from the ancient period. The most spectacular monument is the Kalideh Palace on the outskirts of the Ujjain city. It is a fine example of ancient Indian architecture. The Bhartuhari Gufa is an ancient cave which has some interesting legends associated with it. The observatory at Ujjain is another remarkable example. It was built Raja Jai Singh of Udaipur and put is one of the five such observatories in India and has many ancient astronomical devices. The most important religious event at Ujjain is the Simhasta Mela (also called the Kumbh Mela). The Simhasta Mela or the Kumbh Mela is held every twelve years in Ujjain. 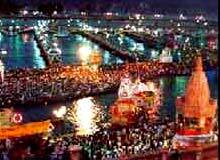 During the Kumbh Mela millions of devotees assemble at Ujjain to have a holy dip in the holy River Shipra. Another yearly event at Ujjain is the Kartik Mela. The Kartik Mela is a fair organized every year in the Hindu month of Kartik (around December) and attracts thousands of people from the nearby areas.